KBN: What is a zemi?! 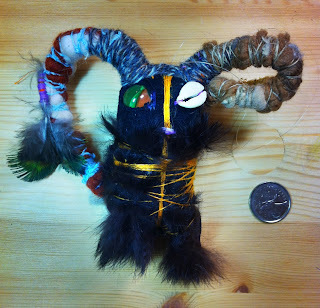 Zemi dolls are based on traditional Caribbean totems. Created by local Victoria artist Rev, each spiritual doll is made with care, and positive healing energy. and you will be entered into a draw to win this Zemi! Draw date will be New Years Eve 2011. I came by the blog to make sure ya'll are going to be open leading up to the holidays... and I find you're giving away a Zemi! I like the one with the rusty nail on Etsy - you're right about the inuit sunglasses, and the yarn makes me think of a sparrow's nest. Miss you too! I love your blog! It reminds me of all the crazy hard work I had to do up north!